PJ has had the opportunity to put his acting skills to the test in a number of roles on Television. Apart from appearances on TV in front of live audiences, PJ has appeared on drama series and skit based comedy TV shows, soaps and presented to camera from all parts of the Australia. He has also performed warm up for Chennel Seven's Better Homes and Gardens and Sunrise. 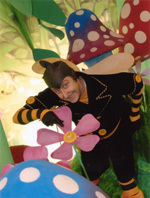 Also employed for his creative flair he has been involved in productions as an actor from character development to assisting creator/producers with execution of material such as his role in the latest Children's TV hit "The Fairies"
Here's some of PJ's credits..